Master volume control. Controls overall volume level. Turning the control clockwise increases the volume; turning the control counterclockwise decreases the volume. Pickup blend control. Controls relative blend of pickups. Turning the control clockwise emphasizes the bridge pickup. Turning the control counterclockwise emphasizes the neck pickup. The detent, or “click,” in the center of the control is the point where both pickups are on equally. Bass control. 15dB. 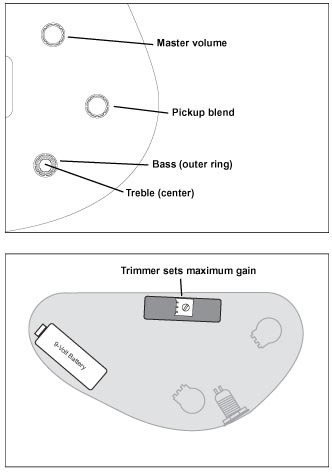 boost or cut of bass at a center frequency of 50Hz. Turning the control clockwise boosts the bass. Turning the control counterclockwise cuts the bass. The detent, or “click,” in the center of the control is the “flat” position, zero boost or cut. Treble control. 15dB boost or cut of treble at a center frequency of 5kHz. Turning the control clockwise boosts the treble. Turning the control counterclockwise cuts the treble. The detent, or “click,” in the center of the control is the “flat” position, zero boost or cut. Trimmer. This control on the circuit module attenuates overall output level. Its factory setting is the mid position. Caution: Setting gain too high may cause distortion.